From the time I can remember, I’ve always been fascinated by twins. It’s so wild that two human beings can be born at the same time and be so similar, yet unique in their own ways. History has it that there have been some pretty wild stories surrounding their bond. There have been cases in which twins have been separated at birth and miraculously found each other many years later, others have committed horrific crimes together, and some are so attached at the hip they’ve never been able to build their own lives. The above video features the 10 strangest twin stories of all time. Be prepared to be stunned by this unique stories. No One Can Believe These Sisters Are Twins! 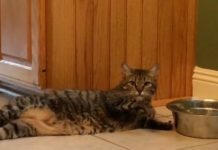 Lazy Cat Drinking Water Becomes Viral Sensation — AGAIN!